Retold from the Hugh Lofting original. 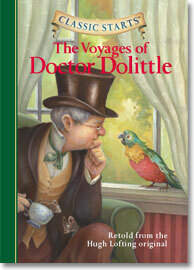 Doctor Dolittle is a very special vet—because he knows how to talk to the animals! So when he hears that there’s a terrible sickness hurting all the monkeys in Africa, the good doctor knows he must go and help them. Soon he’s off on an exciting adventure across the seas in this superb retelling of Hugh Lofting’s beloved classic.